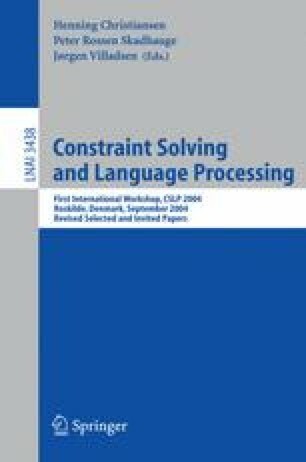 This paper presents the basis of Property Grammars, a fully constraint-based theory. In this approach, all kinds of linguistic information is represented by means of constraints. The constraint system constitutes then the core of the theory: it is the grammar, but it also constitutes, after evaluation for a given input, its description. Property Grammars is then a non-generative theory in the sense that no structure has to be build, only constraints are used both to represent linguistic information and to describe inputs. This paper describes the basic notions used in PG and proposes an account of long-distance dependencies, illustrating the expressive power of the formalism. This version was published online in May 2005 due to the fact that one of the volume editors name was incorrectly written in the original.